One of my favs is the Woolworth Building. Located on Haywood Street, it was once an actual “5 and 10 cents” store! The first Woolworth Store was opened in Utica, New York in 1878. Woolworth opened in Asheville in 1938. The Woolworth Building was restored in 200l, and is now Asheville’s famous Woolworth Walk. It is an art gallery with the work of over 170 local artists. You can see outstanding paintings and photography, huge metal sculptures, glass creations. Elegant jewelry. Creative furniture. Over the years I’ve strolled through numerous times, and am always impressed with quality of the art displayed in the building. It is a great venue to see the commitment to quality, and the passion of so many creative beings! The volume of this creative community is breathtaking. And great news! There is a Soda Fountain! It is in the actual space where the original Lunch Counter was. The milkshakes are to die for, and I love the Reuben sandwich Looks just like something out of the 1950s! I know, because I’ve eaten at a 1950’s Woolworth Lunch Counter! The Building has a ghost, named “Mary”. She appears to be a benevolent spirit, moving breakables off the walls, and setting them “squared up” on the floor in the aisles. She also messes with the lights! Generally, a Woolworth store would open in a city, with Kress Department Store following in a few years. In Asheville, just the opposite happened. And, here’s a newsflash for you: The third floor is under construction right now. There will be loft-style Airbnb units! What a treat to spend the night there. And now my fiber art is in this wonderful building, surrounded by such a creative community. I find my own history circling back around. As a little girl I shopped at a Woolworth’s, and had after school malts. Bought my “Seventeen” magazines there, and of course Yardley perfume! My first job was as a hostess at Woolworth Lunch Counter. And now, my fiber art is in the Woolworth Walk in Downtown Asheville. I feel honored to be included! At one time, we raised a herd of Angora goat: we had about 150! We bred the goats to produce fabulous fiber for hand spinners. Let me tell you, I miss those goats and that abundance of fiber now! When I began creating vessels and then window pieces here in Asheville, I used wool and mohair. Then, I started exploring using a wider range of fibers. The pieces now include: silk, bamboo, tencel as well as mohair and wool. I’m really excited that 2019 will see the use of hemp fibers! Also this year I’m hoping to begin to study the history and use of fiber. Along with goblins, ghouls and ghosts; spooks, slime and slithery things, another kind of magic is afoot in Asheville! Asheville is famous for its River Arts District. The RADA member are working long and late to create a magical treasure trove of art for you to enjoy during our annual Studio Stroll this November 10the and 11th. 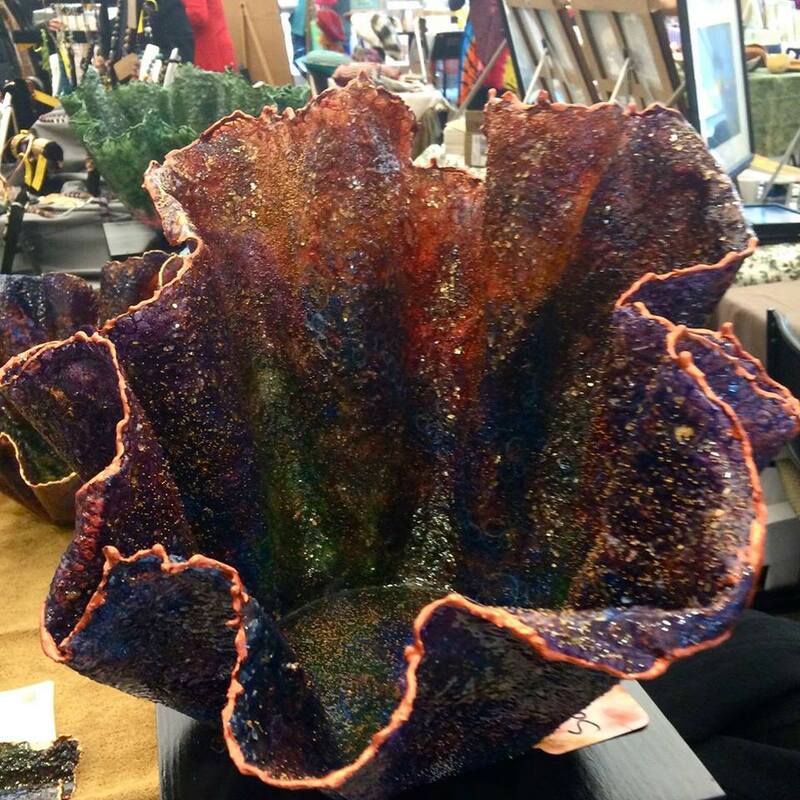 There’s fiber/textile art, pottery bowl and plates, sculpture, basketry. There are paintings. There is jewelry and woodworking. On November 10th and 11th, the magic will be on full display at our annual Studio Stroll! Studios and galleries will be open, with many artist doing the actual work of “magical making” And we love seeing you all, and telling you about how we create our myriad of pieces. Please make a date to treat yourself to a day in the RAD! ”Nebula” made from wool, silk and mohair. Patrick said the kindest words the other day! He had always supported my artistic inclinations and endeavors. He’s a master craftsman, and makes the frames for the custom, commissioned window panels I make. He came into the studio yesterday while I was arranging all these colors for a new piece. Wool, mohair, and a smidge of silk. Patrick remarked that I used many of the same colors in my work. But then he continued with “but you could arrange the same colors in the same pattern and make the same size vessel, but no two would look alike”. How kind is that comment? So I got to thinking about that, and he’s right. Absolutely spot on. Two colors next to each other “blend” into each other as I sew, the machine pushing then into each other. Then there’s no way I could place layers of paint in the exact way over and over again and have the same result in different pieces. I suppose this is one of the joys of being a “maker”, of taking an idea and transforming it into a tangible object. It's not what you think it is! Recently I answered a question on a group site. The question was: tell us something we don't know about yourself". My answer was that my 2nd grade teacher took my box of crayons away because I kept coloring outside the lines. And that now I'm an artist here in Asheville. I included a pic of one of my fiber vessels...the first one I ever created. This is the one I saw whilst having radiation therapy. It set me on my path when we moved to Asheville! The comments humbled me, to say the least. One comment was "I love glass". BUT it's not glass! It is colored wool, silk, and mohair sewn together, cast into shape. Then there layers of paint and epoxy resin! So, things aren't always as they seem! Opening at Asheville Area Arts Council Tonight! Years ago, before I lived here, the Asheville Area Arts Council did a fundraiser for Our Voice. I donated a quilt about shattered/mended hearts. It was so big we had to build a shipping box! Someone bought that quilt, and I've always been glad I donated it. Through the years, I've visited the AAAC so many times, referred so many friends and visitors to see the excellent exhibits they have had. And now, tonight is the opening of a show there, and I'm one of the artists. I think that is pretty amazing. I am so full of gratitude! Swing by tonight (5-8), or visit through July 27th! These pieces left the studio today for a new exhibit at the Asheville Area Arts Council! Here's the blurb from the Arts Council's site: "The Asheville Area Arts Council is excited to announce Contemplative Art in an Age of Distraction, a new exhibit curated by local photographer Susanna Euston. Contemplative Art in an Age of Distraction will consist of large, fine art photographs paired with three-dimensional works to create a unified whole—an artistic gestalt. Euston aims to provide a meditative and contemplative atmosphere to transport the viewer from today’s turmoil to a place of peace. Seating will be made available in the large gallery to allow viewers to sit and meditate on the scenes before them. Participating artists include four photographers—Susanna Euston, Matthew Kraus, Bonnie Cooper and Rick Daley—joined by potter, Steven Forbes-deSoule; Ikebana artist Lynn Forbes; glass artist, Rob Levin; and fiber artist, Paige Houghton. Join them on Friday, July 6, 2018, 5:00 – 8:00 p.m. at the Asheville Area Arts Council’s Thom Robinson and Ray Griffin Exhibition Space to celebrate the opening of the exhibit. Artist talk will begin at 6:30 pm." I so honored to have been asked to contribute to this show. Hope to see you on the 6th! Yesterday I used four different colors of wool to create a sample piece. Whilst the picture below shows the piece as flat, it will be a standing piece, representing the element "Fire". It has not been painted, embellished or resined. But when I put it up to the light, I really like it, especially how the light passes through it. I like it so much flat, that the next step will be cutting it up! The finished piece looks good in my head, so I'm excited to try this! It is so Spring today! Spent the morning in the studio working on a commission piece, and then joined other River Arts District artists for breakfast. When I got home, I cut back some of our hydrangeas. Mind you, these bushes are at least 25 years old. We brought them to Asheville when we moved. I saved ooooodles of the dried flowers for embellishing future vessels and window panels! Loved using dried flowers, leaves and seeds from our little garden in my art! What a blast! The artists of Asheville's famed River Arts District decided to have "2nd Saturdays", meaning the galleries and studios will be busy! There will be shows, demonstrations, workshops, and of course, artists working and sharing "why they do what they do". Not one bit of painting, nor one French knot! Just hours of talking with the many people who stopped by! People from Asheville and people from far away. People that stopped by because they are interested in art. Also, they love to hear an artist talk about their creative process and vision. Please come and see me! This Saturday. Yes, this Saturday. It's Second Saturday in Asheville's River Arts District. Ill be joining many of the RADA artist who will be working and demonstrating in the District's many studios and galleries. And we love talking about what we do. I'll be at Eco Depot Marketplace (408 Depot Street) starting at 2:00 p.m., working on a couple of spring vessels. Here's a pic of the fibers I used. My first use of Alpaca fibers and they are amazing to work with. And maybe a piece that is a "whole new thing"! There will be live music starting at 7:OO, so it will be a great time. Hope to see you! I love the start of the new year...a clean slate, and all those possibilities. In December, while working on the last commission piece of the year, I outlined 2018. So excited about a new exhibit, and several new techniques to use in the studio. Also a new vessel with lots of parts and pieces. I even did a little preliminary work on the armature for that vessel. And then January happened! On the 8th, I see Patrick walking across the kitchen, his body and face listing to one side, and his face going gray. I realized he is having a stroke and call the squad. Off we go to the hospital. By the time Katherine and I got there, they diagnosed a stroke. They gave him a marvelous drug: TPA. Darling daughter and I sat there as the color came back to his face and all the “droop” went from his face and body. He looked so much better by the time Christopher arrived. This is the important part folks: if you suspect a stroke, don't wait. Get help right away. TPA works in about 30% of the population, but here's the important part, TPA has to be given within a narrow time window of onset of symptoms. Patrick was really lucky. We were all really lucky. It is not fun to sit with your children seeing your spouse like that. But he walked out of the Neuro ICU unit a few days later, perfectly fine. He has to make some lifestyle adjustments, but he has a life to adjust. And then January continued. The following Monday I fell and broke my arm. The kind of break where the bones come popping out through the skin. This leads to being in the hospital for a few day getting IV antibiotics and this really horrible cast. My cast is better now, but it was a battle persuading the doctor that it was too tight. My fingers were turning purple and I couldn't move a couple of them! So I'm not getting a lot done in the studio right now, which is hard because I'm so excited about these new ideas. But I’m learning patience which is always a good thing, right? And it is okay to ask for help... thank you, Katharine, for tying my shoes. I also learned how to dictate on the Mac (My left hand can't do a darn thing) and that's why I can finally get this out there! Here's to a marvelous rest of 2018….. a healthy 2018. "Wonderment Wednesday" is the day I try to get out of the studio and visit Asheville. Sometimes it is a hike to gather inspiration from Mother Nature. Sometimes, it is going Downtown and feasting on the Art Deco influences in our City. But today, I went to the Wedge Studio in the River Arts District to see the transformational work of Frances Domingues. She owns FD Design Studio and Gallery. Now I love transformation! For example, I take loose fiber, "floaty" as a cloud and transform them into hard vessels that look like glass. Frances takes flat metal and creates magic. She calls it "Vibrational Oxidized Painting" I've put a pic of one of the pieces I saw today, and a close up of the texture on one painting. Frances' work mesmerized me. There is an opening reception at the Wedge Foundation Cloud Room is on September 21, 2017, from 5:00 pm to 8:00 pm. I cant wait! The only down side to my visit was that Frances wasn't there, so "Hello, Frances"! But What Does Art Have To Do With Football? Last Saturday, I was in Downtown Asheville at Mountain Made Gallery, demonstrating how I create my fiber art. This is something I love doing. And I meet the most marvelous people. Locals, people on vacation, people in town for a wedding, people "stopping by Asheville" on the way home from dropping a child off at Wake Forrest. This time I met a couple. Long talk with the wife and her friend, and they were such engaging women. He is an NFL ref. I've seen him for years, and remembering some of those calls so clearly, especially the San Francisco- Ravens Super Bowl. Oh, do I remember that. So there was that football moment. Then, when I checked my Twitter feed, there is the Dallas Cowboys following along with my artistic journey. But mainly, it was just about art. About seeing a vision in the moment of a bad place (radiation treatment for a brain tumor) and transforming that vision into art. And to being a working artist in Asheville. I'm really blessed, and full of Gratitude. And can't wait for the NFL to kick off! Our son got married last month at a local vineyard. We love her so much, and are so happy for them. It was quite a celebration....happy families and friends, beautiful venue. I slept for two days! I did some quilting for the event, and realized how much I'd missed that medium. Last week, I was working in our garden and was struck dumb by the variety of flowers we grow. Sweet william, lantana, marigolds, morning glories, and my bold and brassy zinnias. All different, but a part of the overall garden. I began thinking "what if my art included quilting? The vessels, lamps and window panels are made from fiber, and fabric is too. No? And I love making these "petite" quilts - only 3x3. They come with a wee easel, and are great for shelves, desks, and....wherever! And by "quilts", I don't mean the kind you snuggle in! Art quilts....full of beading. Some of the petites and the art quilts are in Asheville's River Arts District at Eco-Depot Marketplace. Stop by and see the new additions and other pieces of fiber art! Just finished the final bronze "gilding" on this sweet vessel. Visitors continually remark about the glorious skies in Asheville. From early morning dawn to our spectacular sunsets, we are blessed each day with this incredible blue, white clouds scudding by. Beautiful golds and purple caressing our mountains. So this vessel with the brown mountains on the bottom and spilling up the sides and the blue, white and gold in the skies is a tribute to Asheville's beauty. ...or embellishments. Before the final coat on a window panel, vessel or lamp, I use organic material to add a bit of intrest. I usually head to The Villagers on Haywood Road in West Asheville. Bits of beeswax for flowers in a field, chopped oat straw strewn across a pasture, dried rhodiola branches for light dirt. But I was stumped on this large commission piece. The clients wanted fall leaves and a path (needing "darker" dirt. And that's the fun of doing commission work....listening to the clients and capturing their vision in fiber. Then one morning I'm out in our garden, deadheading, and voila! Strawflowers and marigolds for the leaves and magnolia leaves for the dirt! Pick a passel of those and dried them on my years old drying screen and they are perfect. I feel like Dorthy, "...there's no place like home."! Another day of "talking art" and demonstrating what I do is in the books. Saturday at Mountain Made Gallery in the Grove Arcade, I was painting a sunrise and talking to people all the different fibers I use in my pieces....silk, wool, mohair, and bamboo, to name a few. Downtown Asheville is quite the place for people to visit when coming to our City. I talked to folks from Fort Meyers on vacation. A couple from South Carolina try out their new motor home. People from Arizona in town for a nephew's wedding. A lady from Austin here for a conference. People from Winston-Salem, PA, MA, VA. All over the place. My two favorites, though, were the ladies from Charleston, who were there as "Art Appreciators" and the high school junior from MA who proudly showed me here collaborative entry into a state-wide competition. It was a very remarkable portrayal of the Cliff Dwellers. The kids signed that piece with their handprints, much like the artists of long ago. So a big thanks to all the people who stopped by. And if you are visiting our City, or if you live here, when you see a working artist, feel free to step up and chat! Below is a close up of a smidge of sky in one of my vessels. One kewl thing about the Asheville art community is the joy we artist feel in sharing the "why" of what we do. This past Wednesday, I went to the Summer Solstice Celebration at Eco-Depot Marketplace. Lots of folks stopped by from the Community, but there were many artists there, too. We shared our "whys" and "hows", and our joys in where we are at in our respective journeys. Amazing stories from open and creative people. Tomorrow I'll be Downtown at the Historic Grove Arcade, at Mountain Made Gallery demonstrating what I do and talking about my personal "why". For me, it's all about Gratitude, and that vision of a vessel I had while having radiation therapy. Folks alway ask how I came to creating fiber vessels, window panels and lamps. So many, upon hearing the story, fall into my arms, telling me about their personal stories, or the stories of a friend, sister, mother. It is a humbling experience. And it is so much fun talking with kids about art! So many of them love art and share their projects with me. Believe me, I have so much Gratitude for these events. So please come down tomorrow and chat. The Arcade is beautiful, and there is always something going on Downtown! I'll be there from 11:00-4:00. Hope to see you there! ...I've ever done! The pic below is of what, will be, a large bathroom window. It is the commission piece I've had so much fun doing! The left side show a finished panel. Just the sewn fibers. The right side is after a first coat of resin has been applied. The blue tape indicates the placement of the dogwood grove and the rhododendron shrubs. Once both panels have two coats of resin and painted embellishing here and there, I'll do two more coats of resin. In between those, I'll set in the organic elements: oat straw, beeswax, rhodiola branch, and a little magic! Trust me, when these pieces are mounted, they will look like stained glass! This is the trill of creating a commission piece: designing for a specific space in a home or business, with the hobbies and interests of the about "to be owners" in mind! I could hardly wait to get back from Jack Young's nursery today. Just there to check out the Spring offerings, which were lush and so colorful. When I got home I scurried into the studio to do the finishing gold, grass green and mulberry stitching. This vessel is the first I've done with a lake feature. Many of the vessels have my beloved French Broad River incorporated into the piece, but this is the first lake. I'm really happy with how it looks, and will post a picture when darling hubby gets back with the digital camera. Now I'm starting a new vessel with golds, russets and orange. Should look just like a sunset! © Copyright 2014. All images property of Paige Houghton. All rights reserved.